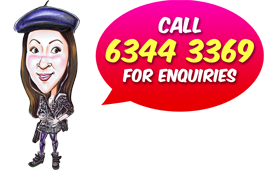 If you are in a rush to get a present, you can order our 3-day express caricatures. 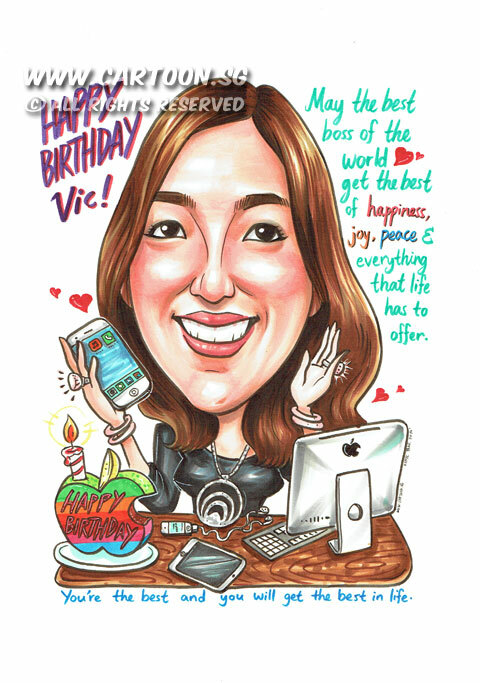 This client requested a birthday caricature for her boss and specified the details that she wanted. Many thanks again to you and the cool artist for your help to get the A4 single caricature done today for my lovely boss. Here’s the birthday message:May the best boss of the world get the best of happiness, joy, peace and everything that life has to offer. You’re the best. and you will get the best in life.Happy Birthday Vic! Thanks Anna for suggesting her caricature standing next to her desk with birthday cake (make sure there is a piece of yellow lemon in the cake, her special buddy baked her lemon cake last night) andiPhone & iPad on the desk. Also, if any shocking pink accessories can be added in any of the piece. And as for the jewellery, let’s stick with the enlarge necklace on both photos provided, this is her favourite one. Here’s the delivery address, hopefully can be sent before 5pm today. I have a special request for the photos (even at different % of completeness/stages) can be emailed to me once available. many thanks again. I will be sending the IB confirmation once I have it in 5 minute.